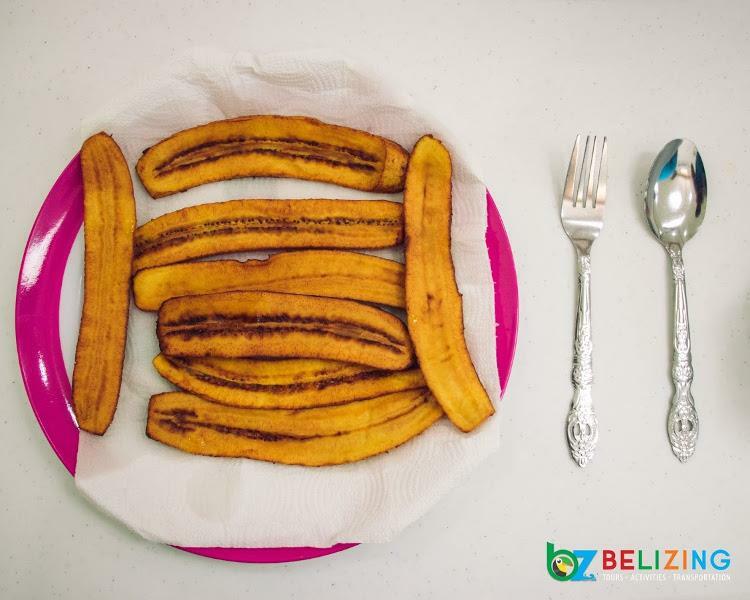 San Ignacio Town is becoming the perfect stop for foodies traveling to Belize. You can enjoy a trip through the stalls at the local farmer’s market to eat like the locals, or even find fresh seafood from the emerging street food scene. 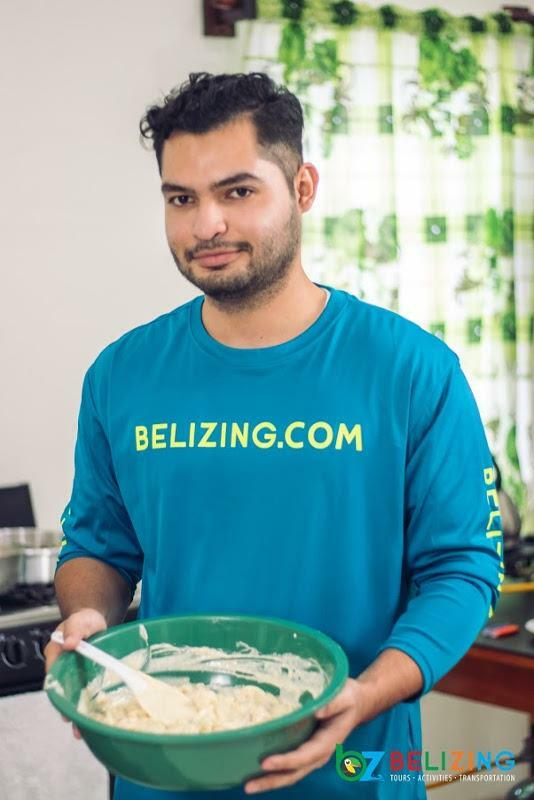 Better yet, you can book an authentic Belizean cooking experience with Cook a Belizean Adventure. This is a MUST-HAVE experience for the next time you’re in San Ignacio. This is more than just a food tour...this is an authetic food adventure! 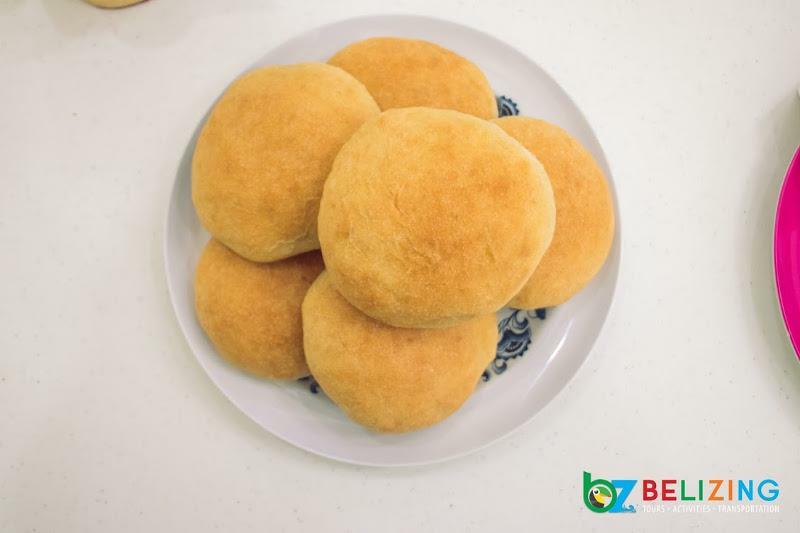 Belizean cuisine should be on your list of reasons to visit Belize in 2019; if you’re a foodie like me, you won’t be disappointed. 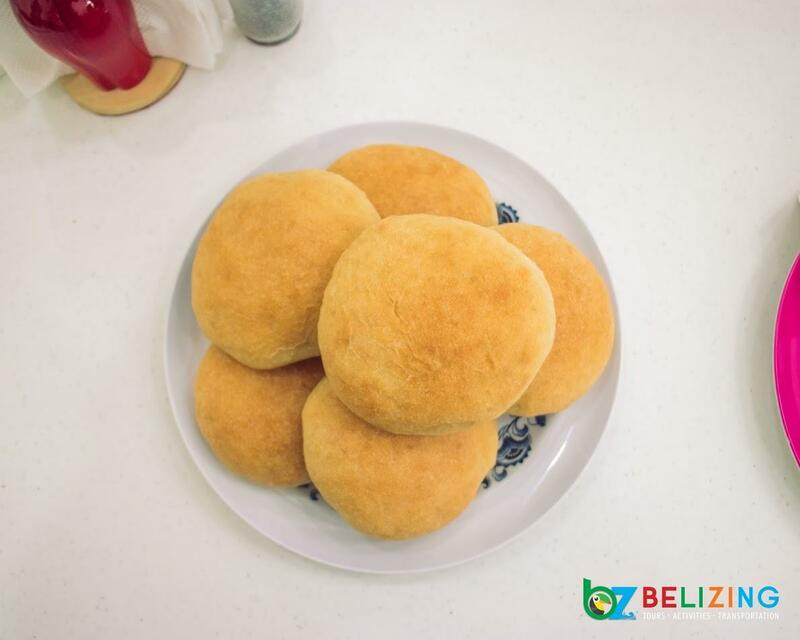 Belize is overflowing with cultural diversity that is reflected in a wide variety of must-eat traditional Belizean foods that you can enjoy on your next visit. 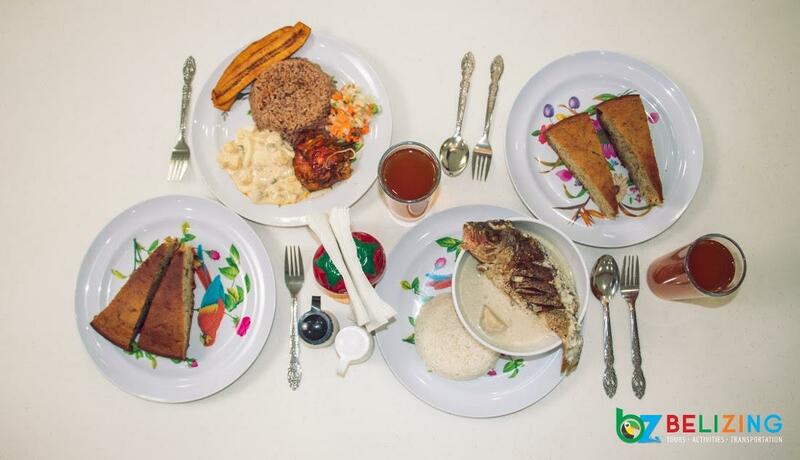 Normally, you would need to travel all over Belize to experience all of the delicious food. 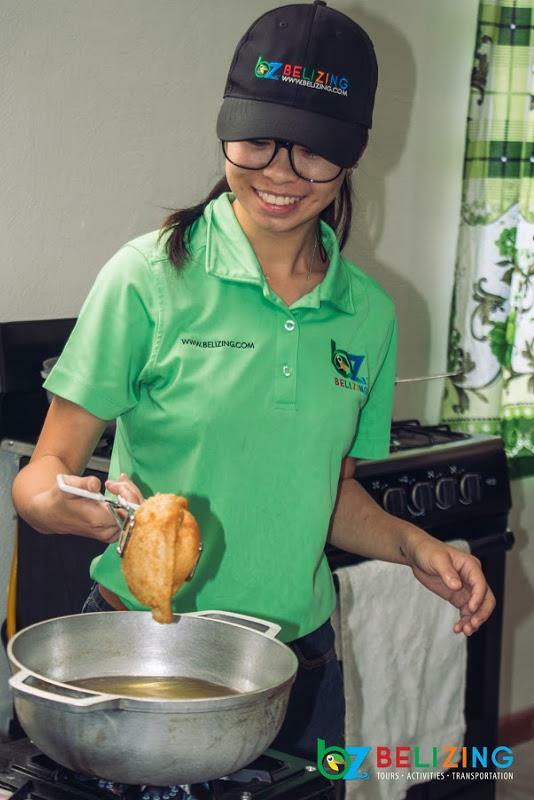 Luckily for you, at Cook a Belizean Adventure in San Ignacio town, you can learn how to cook classic, delectable Belizean dishes such as fry jacks, rice and beans, tamales, johnny cakes, and more, all in one kitchen! 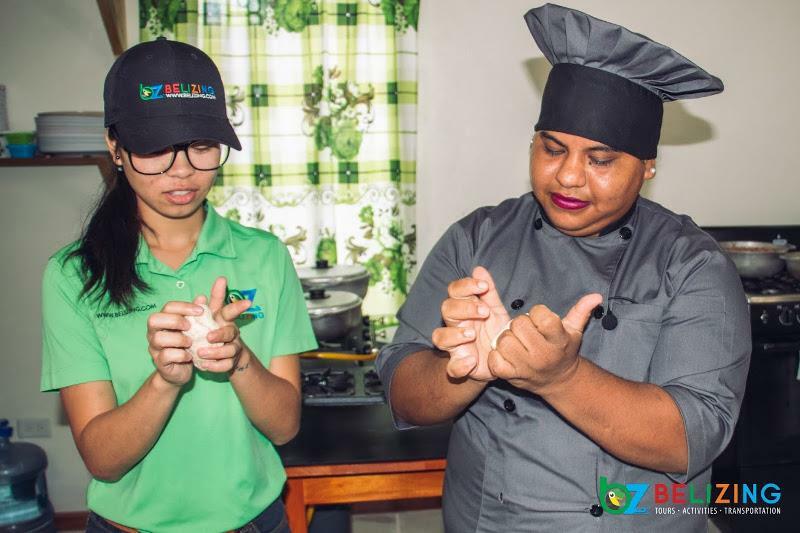 You’ll become a sous chef for a day and you will help prepare a full authentic Belizean traditional meal. Best of all, you will have tons of fun doing it, and you get to sit and enjoy the food with your friends afterward. 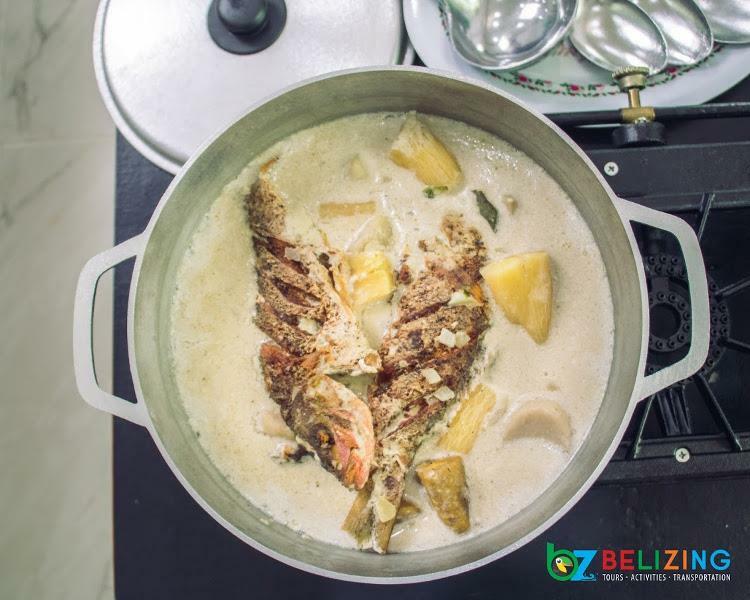 Our Experience cooking classic Belizean dishes. When we visited, we were introduced to Chef Marcia, a resident of the nearby village of San Antonio, Belize. 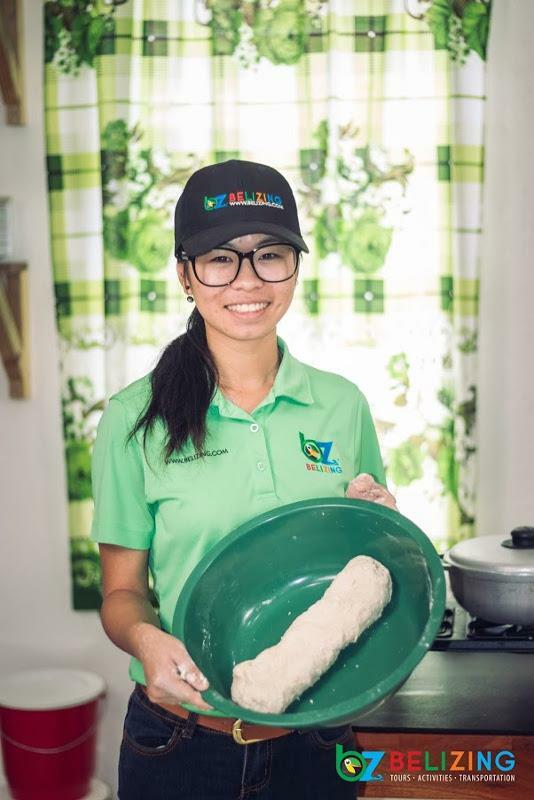 Like many Belizean Chefs, her dishes reflect every corner of the country. Today our job was to help prepare fry jacks and Belizean potato salad. The experience starts with an overview of the menu choices, safety guidelines, and the general process. This guarantees no disasters in the kitchen. 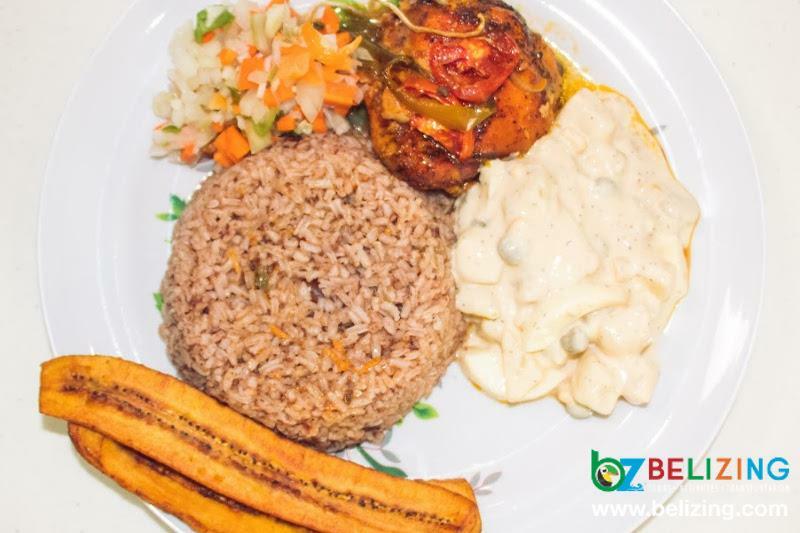 The menu includes a selection of must-taste Belizean cuisines from all over the country, and covers main dishes, side dishes, and even Belizean desserts! 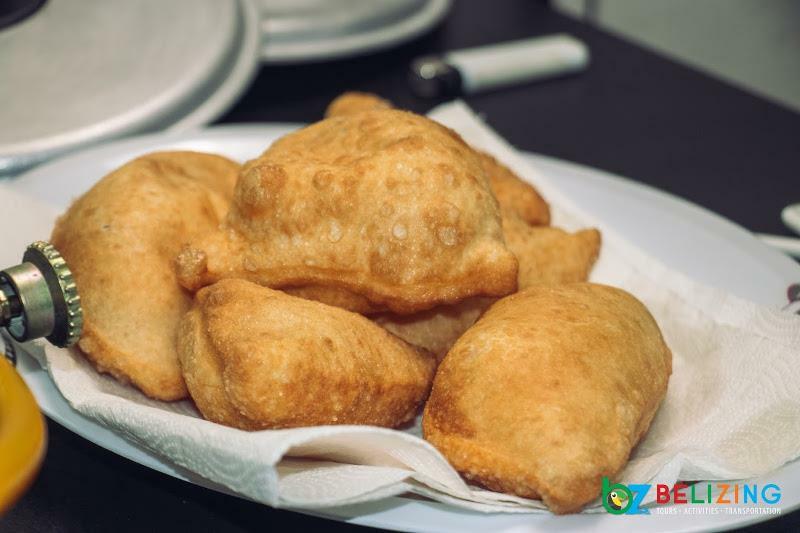 Whether you want to cook up some yummy fry jacks for breakfast or a steaming pot of fish sere for lunch, we can assure you that all the dishes will be worth it. There are no wrong choices on this menu, but it will be a tough decision to just pick one. The lessons and recipe are easy to follow; unlike your basic cookbook guides. All the fresh ingredients are measured for your specific recipe, and you simply follow along and have a fun time and good conversation. 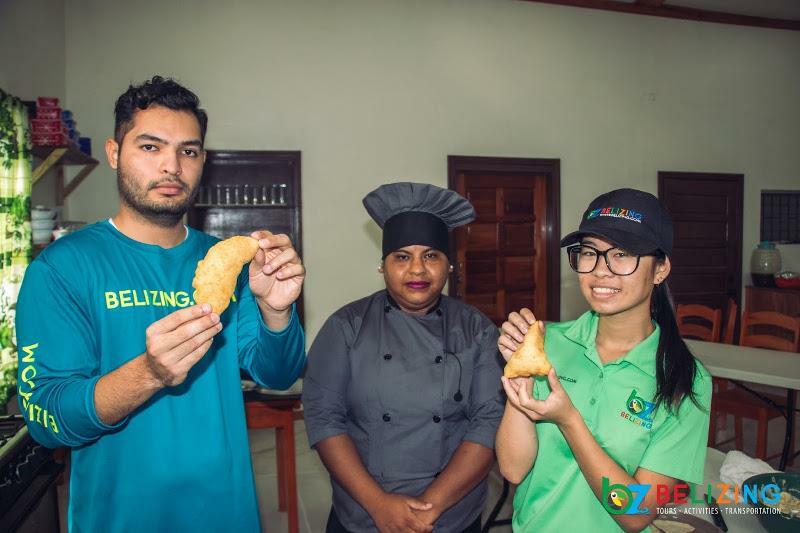 For our first lesson, Chef Marcia took us step-by-step as we learned how to make the famous Belizean ‘fry jacks’. These are deep-fried dough pieces usually shaped in half circles. This recipe has many variations; you can stuff them with ham and cheese for breakfast, or even dust them with powdered sugar for dessert. 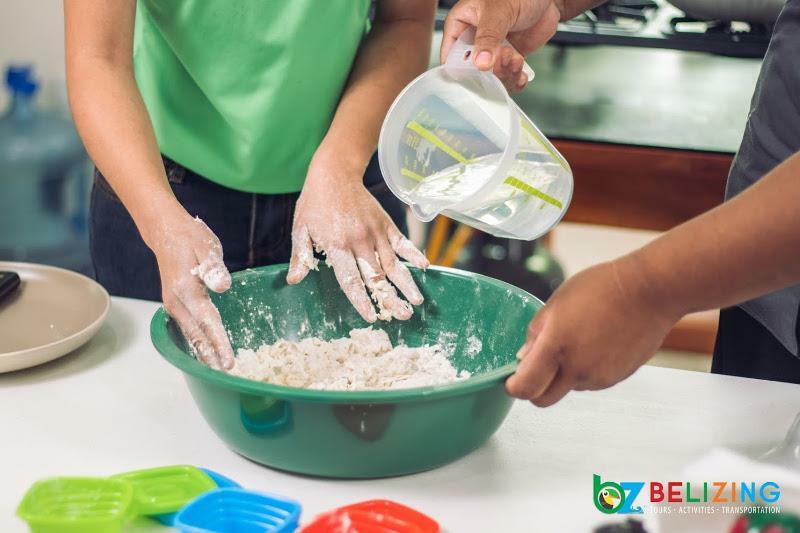 We started off with mixing and kneading all the ingredients: flour, shortening, salt, baking powder, and water until it became a soft dough. The dough was then rolled and cut into the popular size of halves and quarters. 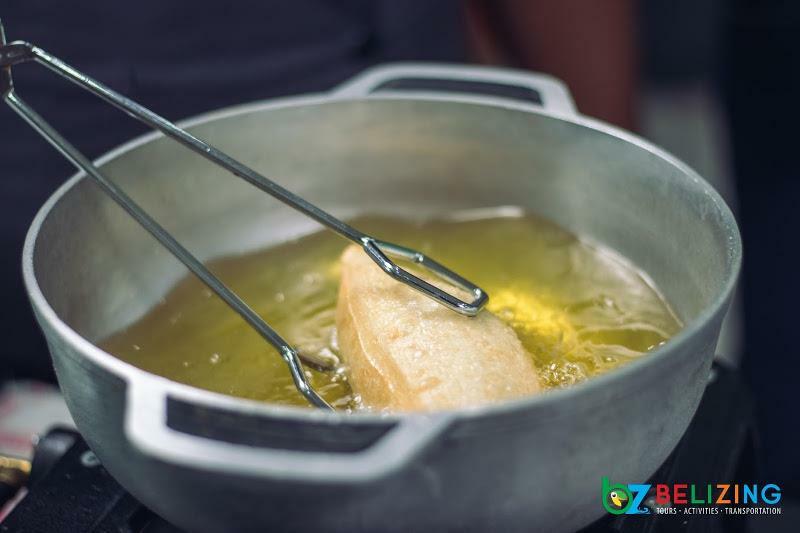 Chef Marcia advised us to cook the fry jack doughs in super hot oil to get that puffy and golden brown fry jack. She knew what she was doing; our fry jacks came out the frying pan perfectly fluffy and delicious. This served as a perfect appetizer while we moved on to our second course. We moved on to our second lesson of the day; a popular companion to the Belizean rice and beans: potato salad. The perfect Belizean potato salad beautifully complements your dish, although you could also have it as your main course...we won’t judge. We placed some cooked and chopped eggs, potatoes, and carrots in a mixing bowl then added a mixture of salad cream and evaporated milk. Making this dish was simple; it consisted of a lot of mixing and tasting. Next, it was time to eat! We dined on rice and beans, stewed chicken, and potato salad that we had prepared. The potato salad had a slight sweetness to it that contrasted the savory gravy that was drizzled over the rice and stewed chicken. If you’re into spicy food, be sure to ask for the onion sauce that adds heat to any food in Belize. 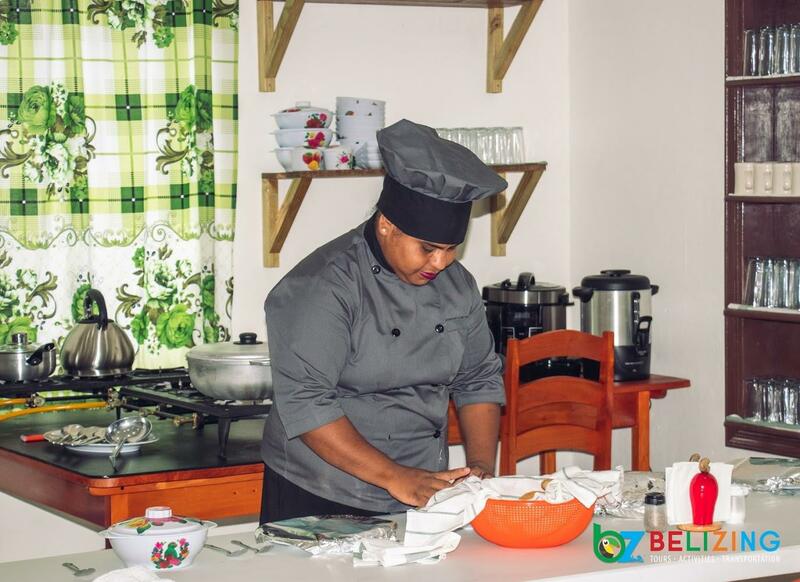 If you’re not interested in cooking your own classic Belizean dish, Cook a Belizean Adventure also offers fully prepared daily specials for both breakfast and lunch that you can enjoy. One of their specials that we tasted was sere, a traditional Garifuna food in Belize. 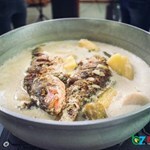 The taste of this coconut-based fish soup transported me to the rhythm-filled beach town of Dangriga, driving my taste buds wild! You can’t skip dessert when you’re here! We got to taste their daily baked banana bread. 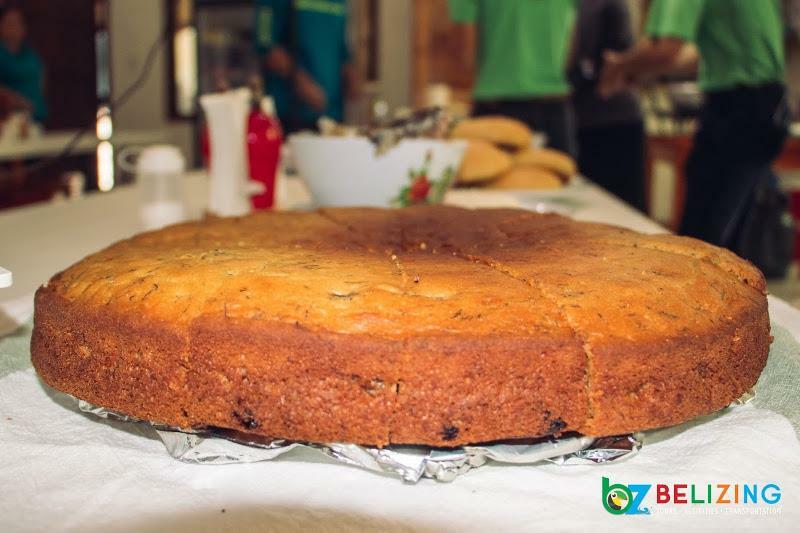 This much loved Belizean dessert always has you going back for seconds. Let me just say that we took some extra slices to-go so we could continue to enjoy it after our cooking lesson. Everything we cooked was unforgettable, which is a strong statement coming from a local who has eaten these foods endless times. Chef Marcia’s cooking made me feel as if I was eating these Belizean dishes for the first time. Best of all, I’m sure I had a hand in making it extra tasty today (maybe not, but I’ll stick to that version of the story). The best memories are certainly created in the kitchen. What made this meal special was the experience of preparing it together with friends. We highly recommend this experience as one of the top things to do in San Ignacio, Belize. 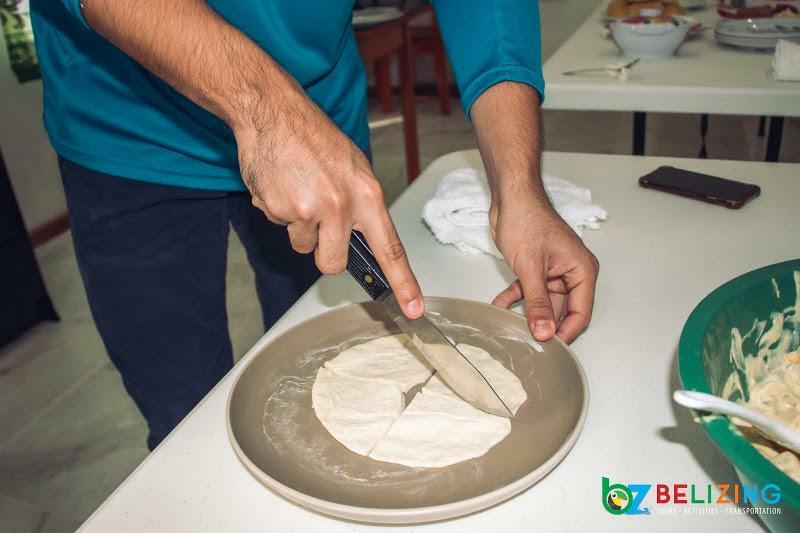 At the end of the experience, you will be provided with the recipes, which makes this Belizean cooking lesson the perfect souvenir to share with your family & friends back home! It’s nice to share pictures, but imagine if you can recreate the experience back home. It’s like a gift that keeps on giving! The Cook a Belizean Adventure kitchen is located just a short 10-minute walk from the center of San Ignacio Town on Buena Vista Street. 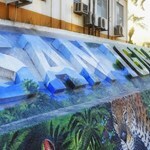 You will walk (or drive) up the hill from downtown San Ignacio. If you get to the Victor Galvez Sports facility then you’ve gone too far. Please note that this establishment is now permanently close for business. The cost of this experience varies on the package that you prefer. The two-hour package is $50 USD per participant, and the four-hour package is $90 USD per participant. The menu selection is different each day, so be sure to look it up before scheduling your experience. We recommend booking in advance to ensure that everything is put together for your selected meal before you arrive. Wear comfortable clothes and shoes, and definitely bring your appetite. They will provide everything else. 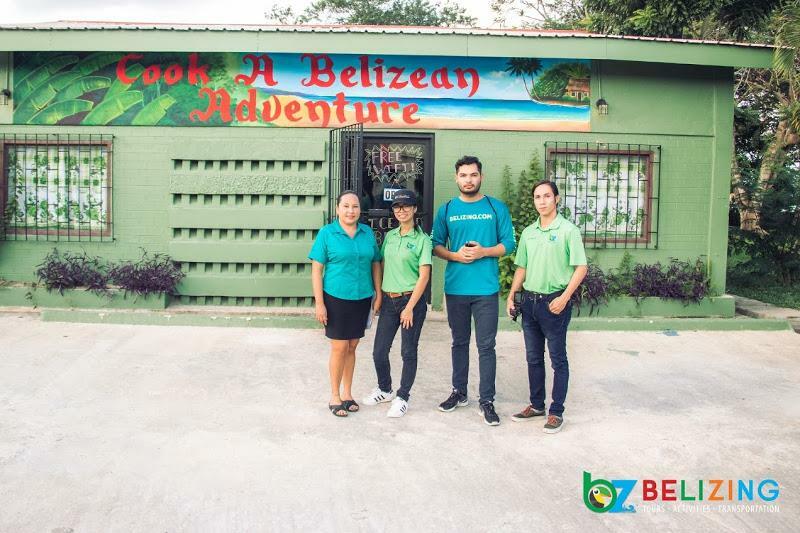 This is such a unique experience, and having the guidance of an experienced Belizean chef makes it well worth the time and money. 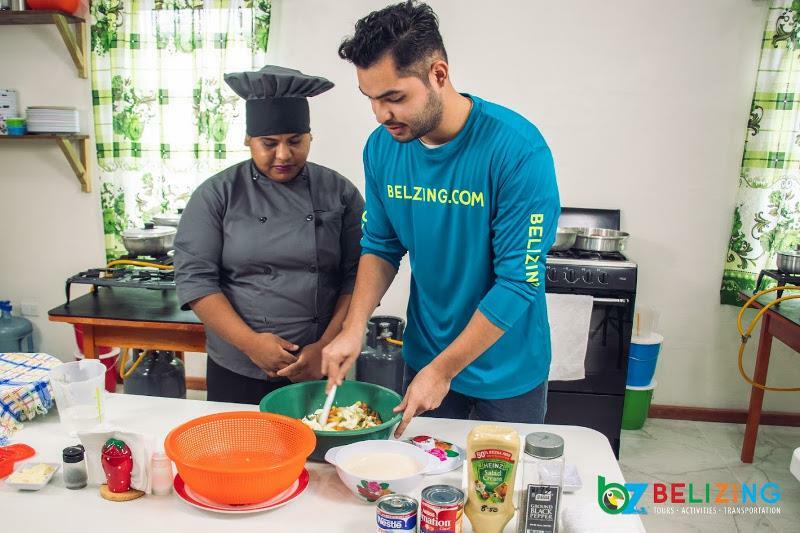 Find the different packages of this great culinary experience on Belizing.com and Let’s Go Cook a Belizean Adventure! Do I need to have some cooking experience?